This is a review of the Greenland (Second Ed.) Board Game, from Sierra Madre Games. A bowhead whale is a majestic and intimidating creature—up to 60 feet in length, weighing up to 100 tons, with a triangular hunk of bone for a skull, which the bowhead uses to smash through Arctic ice on its way to the ocean surface. Yet amazingly, the Indigenous peoples of northern Europe and North America found a way to kill and harvest these massive creatures without modern ships or weapons. Their hunts, conducted by small kin groups operating out of coastal hunting camps, could be extraordinarily risky. Even the job of butchering the giant beasts and hauling the proceeds back home was exhausting and dangerous. But the enterprise was worthwhile, because a single Bowhead might provide enough food and fuel to keep the hunters and their families alive for a whole year. Any visitor to the far north can only marvel at how any community could not only survive, but at times even flourish, in a region where almost any modern human would quickly die of exposure or starvation. The fact that the Inuit were up to this challenge year after year, generation after generation, is testament not only to their discipline and ingenuity as hunters, but also as inventors and field engineers—notwithstanding the sentimental noble-savage stereotypes that still persist. One of the ancient frustrations of whalers everywhere, for instance, was the tendency of spears to detach from a whale (or seal, or walrus) as it tried to submerge or otherwise escape. The Thule (the proto-Inuit ancestors of modern Inuit) solved this problem with an ingenious device known as a toggling harpoon. The weapon featured a spearpoint divided in two parts, connected by sinew. When a beast was impaled, the spear’s forward portion would detach from the main shaft and penetrate the beast’s blubber and muscle—rotating as it traveled, so that when the hunter pulled the spear back toward his boat, the tip would hold fast within the whale, like a corkscrew in the neck of a wine bottle, allowing the carcass to be pulled back to shore. No one ever taught me such things when I was a boy growing up in Canada—largely because no one ever taught me much of anything about Indigenous peoples. Before the 1990s, which brought with it a revolution in the way First Nations, Inuit, Innu and Métis people fought for their political rights and raised awareness about their history, Indigenous peoples were largely invisible to most non-Indigenous Canadians. Thankfully, all that has changed, as the extensive coverage of Indigenous themes on my daughters’ public-school curricula clearly shows. Unfortunately, I have yet to see clear evidence that these materials are truly seizing students’ imaginations. The Indigenous political renaissance of the last 20 years has coincided with a national process—now known as “reconciliation”—by which non-Indigenous Canadians take stock of the many cruelties imposed upon Indigenous peoples, especially the Residential Schools used to forcibly assimilate Indigenous children into white Canadian culture. While it is essential that Canadians know this history, these lessons also can have the effect of presenting Indigenous peoples as passive victims caught in the headlights of Western colonial predation. Perhaps the most popular text now used to educate young Canadian children about the country’s Indigenous peoples, for instance, is The Secret Path, an illustrated book about Chanie Wenjack (1954-1966), an Anishinaabe boy who fled a residential school in Ontario and subsequently died from hunger and exposure. The story is tragic and haunting. But much as with the Holocaust-education materials I learned when I went to Jewish school, the accumulation of such narratives can have a numbing effect. Even tales of great cruelty can become repetitive. Today’s children are discouraged from playing racist schoolyard games such as “cowboys and Indians,” since they portray Indians as savages. That’s a welcome development. But the least that could be said for such racist games is that they presented Indigenous peoples as having some form of agency. A model of representation that centers entirely on victimization, on the other hand, can strip Indigenous people of any agency whatsoever. This is not only condescending and ahistorical, but also serves to discourage non-Indigenous people from exploring the fascinating histories of Indigenous peoples. “We once told our own stories about ourselves wherein we were the heroes,” Johnson wrote. “We were great hunters, providers, even warriors when need be. We were wise grandmothers and medicine people. We told stories about ourselves and about mithosin kitaskinâw—our beautiful land.” One of the effects of the European colonization of the Americas was that many of these stories were, quite literally, destroyed. As a white writer, I have no expertise or moral authority in regard to the complex project by which Wîsahkicâhk and his counterparts in other Indigenous communities will get their stories back. But I can speak to the manner by which today’s white intellectuals have, often with good intentions, systematically undermined that rehabilitation project. While Indigenous peoples were, as Johnson writes, “hunters, providers, even warriors,” they often are transformed by today’s white writers and activists into a sort of collective, endlessly suffering Chanie Wenjack—a baby-Jesus for our secular age. Or they are portrayed as elves of the forest, preternaturally wise Lorax-type figures who are trotted out as political props for the convenience of white environmentalists. Chanie’s suffering was real, as was the suffering of the thousands of other innocents who suffered similar fates. But while such stories can inspire guilt and pity among school students, they are not representative of ancient civilizations whose extraordinary accomplishments have the power to fascinate and inspire. Board-game designer Philipp Klarmann might not come off as the sort of creative genius likely to blaze a new trail in the field of Indigenous education. He’s as white as me—and from Germany, a country with no Indigenous population whatsoever. His other gaming credits include Reichshoffen 1870, a 2007 game about the Franco-Prussian War; and Magenta 1859, a similarly obscure offering about the Second Italian War of Independence. But Greenland—a game he conceived in 2014—has attracted far more notice. Klarmann has no apparent personal connection to any Indigenous community anywhere. In an interview with Geof Gambill of The Long View podcast, he said that the idea for Greenland popped into his head after reading a magazine article discussing various theories as to why Norse settlements vanished from Greenland in the 15th century, as well as a 2005 novel by Jane Smiley called The Greenlanders. Then again, it makes sense to me that Klarmann comes to this area as a self-educated amateur—because no career academic, historian, writer or activist whose work is closely connected to Indigenous issues would dare make this kind of game, which, though anchored in real historical detail, flies in the face of fashionable taboos and stereotypes. Modern Greenland—the continent not the game—is one of the least traveled places on earth. Now home to just 56,000 people (almost all of whom inhabit Greenland’s ice-free coast), the place exists as an autonomous constituent of Denmark. But a thousand years ago, the island witnessed an important historical saga that changed the fate of three different civilizations. In a 2014 interview, Klarmann’s co-creator, Phil Eklund, set out the stunning back story of this inter-civilizational meeting on Greenland’s shores. All three of these groups—Norse, Thule and Tunit—had originated tens of thousands of years previously within the same cluster of central Asian peoples. The Norse were part of the group that had migrated west and become northern Europeans. The Thule and Tunit were part of the group that migrated across the Bering Strait as Amerindians. About a thousand years ago, all three civilizations ran up against each other on the world’s largest island, a sort of unintended reunion after countless generations of separation. Technically, Greenland is not a true “board-game”—because there is no real board. (An actual map of Greenland would have made little sense as a basis for gameplay, since the vast inland bulk of the island is uninhabitable.) During the imagined time frame of the game, just as now, Greenland was a marginal place for human habitation—a place where crops are difficult to grow, and many of the tastiest animals also happen to be ferocious. (The name “Greenland” originated with what was, in effect, a cynical Norse marketing ploy aimed at attracting colonists to a land of supposed plenty.) Wood was so scarce on Greenland that ships traveled all the way to Labrador for imports. For their iron, Greenland’s Indigenous metallurgists were restricted to bog deposits, and the remains of a 58-ton iron-rich meteorite that hit northwest Greenland 10,000 years ago. Tools and weapons often had to be carved from whale bones and other exotic materials. The difference between life and death for many clans could be a single metal cooking pot passed along from mother to daughter—a critical tool to pasteurize the milk of domesticated livestock. Competition in Greenland takes place through the struggle for resources—food, especially—which can be won through the allocation of population tokens that represent each player’s available hunters. There is some combat, but most casualties are caused by hunting accidents and catastrophic climate shifts. Disease also plays a huge role: During my first game of Greenland, I established a strong lead over the other two players before an epidemic ravaged my Inuit seal-hunting camp, cutting my work force in half. My Tunit and Norse opponents, meanwhile, had diversified by sending off colonizing forces to the “New World” of Vinland and Markland—known today as Canada—where life could be even more dangerous than in Greenland, but also offered rich bounties in metal and ivory. Each Greenland game turn, representing a generation of clan life, is full of existential choices. Elders can become whaling chiefs, warriors, trackers, mariners or shamans. If food is scarce, an elder also can make a long final walk into the snow, so that his share of the food supply might be used to keep younger clansmen alive. If conditions are desperate, and there are no ringed seal or (relatively) docile muskox to hunt, the clan might have to risk hunting polar bears or orca. Walrus offer an especially rich bounty in food, blubber and ivory, but also can be driven into complete extinction. As the game progresses, new cataclysms and opportunities emerge. Players have the chance to cling to polytheism or embrace Christianity, marry the daughters of other players’ chiefs, and even proselytize other players or prosecute heretics within their own society. To win at Greenland, you don’t just have to make careful decisions about what to hunt, but also what technology to pursue. While the reductive nature of white entertainment culture tends to present Indigenous peoples as timeless sages, the need to survive in this harsh climate sparked all sorts of extraordinary technological advances—including dog sleds, slit-designed snow goggles, and the aforementioned toggle-headed harpoon (a technology that Europeans did not fully adapt until centuries later). Everyone has heard of the kayak. But fewer know the umiak, a much larger boat that could accommodate large families and more than a dozen oarsmen. The Thule made sails out of seal intestines. They even used some of their scarce wood to provide hunters and mariners with carved maps of Greenland’s complex system of fjords and ice-sheets. Indeed, the advanced technologies that the Thule brought with them when they sent their whalers and war parties south and east out of (what is now) Alaska help explain why, when the real battle for Greenland ended more than five centuries ago, the Inuit came out on top, while the Norse fled and the Tunit passed into history. 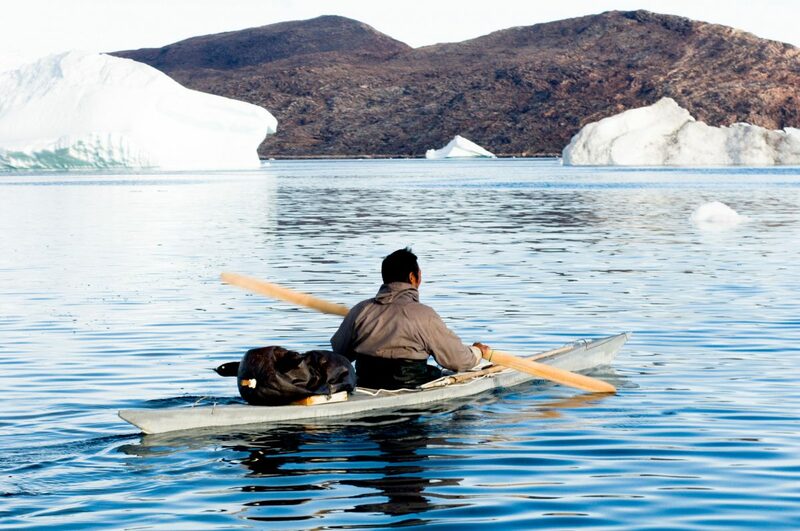 Because Greenland is a game, it emphasizes the kinetic aspects of Indigenous societies—the sailing craft, the hunting techniques, the migrations. This presents a welcome contrast from the gauzy treatment that the Inuit often get in modern art, scholarship and journalism—which tends to lionize the Inuit on the basis of qualities (real or imagined) that (by no coincidence) are prized in modern (white) academic culture: feminism, environmentalism, pacifism and egalitarianism. As I listened to the interview, I waited for Klarmann to talk about how he had an epiphany—how he had come to understand his own Eurocentrism, and realized that he was Othering the Tunit and Thule by stripping them of agency. But over a two-hour interview, he never mentioned any of these things. He simply wanted to make a better game—which meant giving an inner life to the other societies that shared Greenland’s land mass during the period depicted by the game. And without intending to, Klarmann made the Indigenous players the game’s real historical stars. We all know that Medieval Europeans had metal pots an swords. But few first-time Greenland players will know that Indigenous hunters used a remarkable device, called a seal scratcher, that simulated the sound of a ringed seal clawing its way through an ice sheet—thereby signaling to other seals that the coast was clear. (It very much wasn’t.) Greenland is full of marvelous little discoveries like this. Needless to say, I am hardly the first writer to note the need to emphasize the agency of Indigenous peoples amidst the current surfeit of victim narratives. And one now often sees Indigenous themes and characters featured prominently in historical documentaries and novels. But it’s hard for even the most creative artist to inspire people on a made-to-order basis. In 2018, for instance, famed Canadian musician-turned-politician Wab Kinew and illustrator Joe Morse produced a children’s book called Go Show The World: A Celebration of Indigenous Heroes. It’s a beautifully produced work, honouring such diverse figures as Shoeshone explorer Sacagawea, Olympian Jim Thorpe, Dr. Susan Laflesche Picotte, the great warrior Tecumseh and NHL goalie Carey Price. But even in the way they announce themselves, such projects tend to have an unavoidably didactic quality to them. Moreover, in life as in literature, the ability of a true hero to inspire will always be connected in her magnetism as a singular entity—her ability to bend people and events to her own intellect, courage or will. A hero who is described as a mere component of a larger catalog is always deflated in the process, reduced to the status of educational prop. I am trying to think how much less effective Greenland would be—both as a game, and as a tool for education—if it were instead called Nunavut, and were designed by, say, a committee of Canadian education officials seeking to create a tool to promote Indigenous/non-Indigenous reconciliation. Such a game would no doubt be run through so many focus groups and experts that it would come out the other side as a politically correct awareness-raising exercise with a few dice rolls thrown in. Which isn’t to say that raising awareness is a bad thing. It’s not. But, as with falling in love and finding one’s purpose in life, it tends to be something that happens when you’re not trying to do it. Klarmann and Eklund didn’t care about getting players to admire Indigenous peoples, even if that is what they achieved. They were just two nerds trying to make a good game. In Canada, the typological distinction between Indigenous and non-Indigenous peoples has become embedded in every aspect of policy discourse, as if we were creatures from different planets. According to the dominant reductionist narrative that was all too common during the colonial era, Indigenous peoples were ignorant savages. According to the dominant reductionist narrative that is all too common today, Indigenous peoples are preternaturally peaceful and conscientious. The true history of Greenland upsets both these narratives—because it overturns the simple paradigm of white people as colonizer and Indigenous peoples as colonized. In Greenland, the conquering Inuit showed up more than 200 years after the Norse, and survived long after the Vikings (and Tunit) were defeated, even if the degree of contact among the three civilizations is unknown. And while the circumstances under which the Norse abandoned Greenland remain obscure, their last writings report persistent and deadly Thule attacks. None of this should be especially surprising, since this kind of ferocity was simply the baseline requirement for group survival in most parts of the world, during most periods in human history. Following one of the first encounters between Thule and Tunit, according to lore, an Inuit at the scene reportedly described the Tunit as “easily put to flight and it was seldom heard that they killed others.” If true, that certainly helps describe the Tunit fate. A good game, like a good movie or book, can put a player into the shoes of another human being. That’s most obvious in a first-person-style videogame, where the action prompts a player to duck and wince as if she were experiencing the in-game action personally, becoming the hero of her own story. Tabletop games are more abstract, but they can achieve an analogous result on a broader thematic scale. To immerse oneself in Greenland is to inhabit the strategic and logistical challenges of the Norse, Thule or Tunit. (A subsequent game expansion also includes the Sámi, who were based in the northern part of Scandinavia. But their connection to Greenland was, even by the designers’ own claims, somewhat speculative.) The connection a player feels with these ancient peoples doesn’t come through pathos, or empathy, or some willed act of “reconciliation.” For a competitive gamer who truly immerses herself in the game’s historical premise, it’s a naturally felt sensation that emerges from the inwardly felt heroism of role play. That’s the way it was for me, certainly: Catching whales, killing Norsemen, occupying Vinland—all of it brought me not just an endorphin rush, but also an enduring curiosity about Indigenous history, an effect that persisted well after the game was over. And Greenland isn’t an isolated example. I had a similar experience when I played the British side of the card-driven wargame 1812: The Invasion of Canada, in which I found myself commanding a mixed force of British Redcoats, militia and Indigenous soldiers trying to fight off American invaders. While I had long known, in the abstract, that First Nations fighters had played a major role in the War of 1812, the game mechanics showed me exactly how well irregular Indigenous units—with their smaller logistical footprint, and their ability to strike quickly across rivers and lakes—complemented the slower, heavier regular British units. I’m not arguing that board games can lead Canada’s Indigenous and non-Indigenous peoples to some sort of giant, collective kumbaya moment. But I do think that my experiences with Greenland and 1812 supply a lesson that can be generalized to other media. One of the themes that has animated the rise of modern identity politics more generally, and the campaign against cultural appropriation specifically, has been the idea that whites and members of minority groups inhabit mutually unintelligible milieus; and so the only way social justice can be achieved is if the dominant group (whites) simply absorb, and uncritically accept, the narrative of pain and dispossession supplied by less privileged groups. This social-justice approach may work for some. But it will never work for all. Even putting aside questions of race and tribe, humans are not trusting creatures. In many cases, they require some viscerally felt signal from within—some transformative experience—that allows them to step out of themselves and inhabit, even for brief fragments of time, another identity. This is why we honour books such as Uncle Tom’s Cabin and Handmaid’s Tale, or films such as Schindler’s List and Philadelphia, which embed important messages under cover of art. While Greenland does not aspire to high art, I would submit that it can have the same edifying effect on those who engage with it. Norse people certainly didn’t come from Central Asia, they’re Germanic. The Finns came from Central Asia (or their ancestors did). We think of Germans as coming from Europe because they first enter our popular historic record in their encounters with the Romans in central Europe 2000 years ago. But go back 4,000-10,000 years BCE – the same timelines as the First Nations settling the Americas from Asia – and their ancestors were nomadic tribes from central Asia who slowly worked their west. – Identity politics is bad, except when indigenous people do it. – White people should talk more about indigenous people by including them into the colonial government’s public education system, but also white people do a terrible job of telling Indigenous stories. Be prepared for accusations of racism if you try. – Indigenous people are too frequently “othered,” but you can only be indigenous if you belong to a Stone Age society classified as colonized by white Europeans. A German in Germany is not indigenous. – Indigenous people don’t need patronizing, but schools should focus more on technologies indigenous people invented first because they needed them to survive, but presumably not on similar inventions by Europeans, or there would be little time for much else. I could probably go on if I reread this article, but suffice it to say that educating the reader on Inuit life and history could have been done better without the white guilt and racial nitpicking so common among Canadians these days. This was my impression as well. “Klarmann has no apparent personal connection to any Indigenous community anywhere.” Umm, what about Hermann the German whose forces defeated the Roman legions? They avoided colonization by the Romans and so are not victims. Is this game popular among Inuit people? I’m part inuit Greenlander, first time I heard of the game. Would love to try it though. It is my understanding that Inuit survive long harsh winters without fruit or vegetables. If such is the case, why don’t they get scurvy? Is there some ingredient in sealskin which substitutes for vitamin C? Whale skin (inuit delicacy 🙂 was probably the most important source of vitamin c, which has plenty of it. Inuit’s fruit was berries (crowberries, blueberries) which they gathered in summer time and hopefully lasted through out the winter. Raw meat contains small quantities of vitamin C which cooking almost entirely destroys. Meat and fish were consumed raw, there being very little firewood even during the short Arctic summers. Wonderful review. if you haven’t read it, I recommend Kabloona. The story of a Frenchman’s two extended sojourns among the far northern native peoples. I think it’s worth noting that although the subhead says this is a review of the second edition and link to the (outrageously priced because it’s out of print) second edition on Amazon, the pictures in the body of the review show the third edition, which is the edition that’s currently in print (and thus more reasonably priced). Interesting article. It is wrong though to say that Germany has no indigenous people whatsoever. Germanic peoples have lived there far longer than the Inuit have existed in Greenland. As the article concedes, the Inuit were not the first people in Greenland, they wiped out the previous Dorset or Tunit population. So if we accept the Inuit as being indigenous to Greenland, we cannot deny that Germans are the indigenous population of Germany… Unless there is a political agenda to promote. I have often thought that the quote “history is written by the victors” extends to more than a narrative of past events, but to the subtle suggestion the winner distorts the moral validity of a conflict. No where is this more obvious than in Canada. Is it? When I was a kid we admired the Indians just as much as the cowboys.